Kelcey Anisah Gilbert, age 20, of Orlando, Florida passed away on Monday, April 1, 2019. She was born in Orlando, Florida on April 26,1998 to parents Abu Haqqah and Ashley Walding. She is survived by two brothers, Sean Gilbert, and Dustin Walding; two sisters, Marissa Gilbert, Jodi Walding; grandmother, Ann Walding; grandfather, Alan Walding, grandmother, Justina Hagley; grandfather, Radix Hagley; aunt, Tricia Walding; uncle, Troy Walding. She is preceded in death by her mother, Ashley Walding. A gathering of family and friends will take place from 4PM-8PM, Sunday, April 14 at Newcomer Cremations, Funerals, and Receptions, East Orlando Chapel. A Memorial Service will begin at 6:00 pm. To share a memory of Kelcey or leave a special message for family, please click the Share Memories button above. Add your memories to the guest book of Kelcey Gilbert. Dont understand it,why you were needed there but that is my only comfort is knowing you are with your mom,hugging and laughing! You will always be in our hearts,We will live for you. Loved so much is what you are. Give your mom my love sweet girl. Neighborhood.I remember all the memories like it was yesterday. I remember we were always in the hallways together we were allways 5 muskiteers with our other friends Lol but me and Kelcey had the most classes together going from class to class in Middle School. Always together talking and laughing during class time getting in trouble for giggling and talking to much while we we're suppose to be doing classwork you were always an outgoing, funny girl always making me laugh and also making the class laugh too and also the teacher our class clown that we loved so much an amazing person that can make a horrible day Into a fun day happy day Always the funny girl. Also me and Kelcey use to beg our teacher not to separate us 2 from the same group we had table groups in class we use to ''Say Pease Please Mrs Ortiz give us another chance please lol showing our sad faces to her always unseperable bond and we were able to stay in the same group but we use to whisper Lmaoo just to stay together Bestie Forever. Memories that I will always remember . 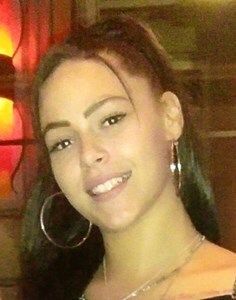 You Will Forever Will Be Missed My Dear Friend Rest In Peace Beautiful Queen Kelcey Untill we meet again We love you. I don't know where to start you my wall all i got and this is tearing me up inside. Kelcey you're beautiful from the inside and out!! You and i bond is so inseparable even though your gone i still feel your presence and that's what is keeping my head up. All my first were basically with you from as far back as i can remember, I have so many amazing memories of you and i'm grateful for that.I could go on and on about all the good times we had. You are my family and i want you to know i'm here for yours. i promise to do everything i can to try and make this easier on everyone. Baby girl it was just way to soon i never thought in a million of years our journey would be stopped so suddenly. i ask the lord everyday to send you back to me. Send you back to us! i hold on to the picture of you holding Nehemiah cause i know ill never get one of you holding my daughter and that brings me to tears. i feel empty i feel like half my heart has been ripped out my chest, but that's only because it has you literally were the better half of me. My best friend! nothing can take that away from me. I'm so happy that who u were is showing i'm touched by how many people you've touched and i am proud of you i just wish you were still here cause your work wasn't done. Fly high baby girl, im holding on to the fact that you are with your mom and you no longer have the worries and stress of man and flesh because i remember how hard times got but your a fighter and its my turn now to fight and to be strong to keep going. i love you Kelcey Annisah Rose Gilbert with all of my heart! I didn't know Kelcey personally, but I was a morning regular at her job. Every morning she would make me laugh and even when I'd look upset she would make sure to say something that would lift my spirit. She was a sweet, beautiful woman and she will be missed greatly. God gained an angel. My heart breaks for the loss of such a beautiful loving young lady. God has you in his arms now baby girl and I try not to question this. I love you for all the genuine love and care you have shown others. You will always be in my heart and thoughts. Until God prepares me to see your beautiful soul again fly high with the angels, you have earned your wings. I did not know Kelcey for very long. But, the time I did know her....it was beautiful. I have three kids 9,8,&3. My kids adored Kelcey, as she did them. She always made us smile. One night I was having a bad night. Kelcey saw me parked at the circle K . She had just got off her shift at Jeremiah's. We talked for about 20 minutes. She made me feel like I was a better person(despite how I felt about myself inside). She always tried to get my 3year old to smile when she was having a bad day as well. Kelcey will be truly missed. Kelsey was a beautiful girl inside and out. Every time I saw her she was upbeat, friendly and always so sweet. My little girl just loved her. She will definitely be missed by so many. Like many, I was shocked and saddened by the news of Kelcey’s passing. I am a regular at the Circle K and can be found there 3- 4 times a day refilling my Polar Pop. You never knew who would be working when you walked through the door but there was something a little more special about seeing Kelcey behind the counter. She was such a sweet girl and always had the ability to make my day a little bit brighter. She would love it when I brought my dog with me for the quick trips to the store. She would sneak him an old hotdog or two from the grill and spend a couple of minutes loving on him. My wife and I had a few conversations with her about her plans for the future. I always admired her desire to finish nursing school and make a better life for herself. I personally do not believe in a life after death but I hope for Kelcey’s sake, I am wrong. She was taken from this Earth way too soon. I just want Kelcey’s family and friends to know the positive impact she had on my family. My condolences to all of her loved ones. I can’t even begin to imagine what you are all going through. My name is Tina. Kelcey always had a big smile on her face every time I came in to the store to visit my Subway. I would joke with her on how she had a twin and I showed her a picture of my daughter in-law. She said "She does look like me". She was a very Beautiful and intelligent young lady. Her Parents did a great job with her . My heart hurts for her family and you all are in my prayers. She is very much loved and will always have a place in my heart. I worked with her at Jeremiah’s in mount Dora, my first day on the job I had to shadow her and she was the most genuine helpful person I’ve ever worked with. She was so kind and would always compliment me and my “cute little belly”. She will be missed dearly, sleep peacefully angel. I Miss You So Much BabyGirl, I remember our moments like it was yesterday all the things we did as kids together you were the first person I met when I moved into the neighborhood I fell off of my bike & you helped me up because that’s the type of person you were, Showing me how to drive, Going Swimming, Walking to school together (Having your dad drive us in the hummer), Having sleepovers, eating all the food we was always eating good, Having dance battles in your house & we were always together, My heart was broken when I moved leaving such a good friend but we always kept in touch, I remember you tapped my shoulder at universal in November of 2016 You were the last person I expected to see baby I should’ve hugged you longer, I will always have you in my heart mamas f&a I promise you will live thru me, I’m so sorry you had to go so soon but you are in a better place beautiful . You always talking about your mom and now you are finally at peace reunited with her rest well baby. Kelcey was the first person i met when i started elementary school, from the very beginning we were inseparable. She was so bubbly and beautiful, with her laugh she could put a smile on anyone's face. After the first night visiting her house, i was there every chance i got. So many memories flow through my head, Universal, a weekend at Hard rock hotel with jody, toots house, walking around the neighborhood for what seemed like hours, and always getting our selves into some trouble. My heart hurts for letting our friendship slowly fade over the years, she will ALWAYS be loved, always be missed and will live forever through our hearts and keeping her name alive. She finally gets to see her mom again and thats probably the only thing that puts me at peace with all this. I love you kelbel, watch over us and sleep in peace beautiful.